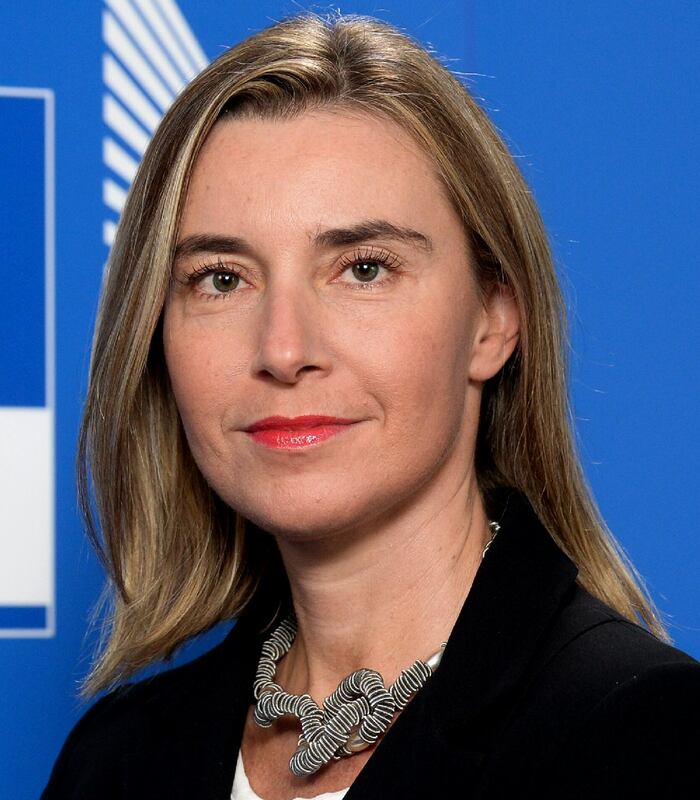 Federica Mogherini was born on the 16th of June 1973. She is an Italian politician and the current High Representative of the European Union for Foreign Affairs and Security Policy and Vice-President of the European Commission in the Juncker Commission since 1 November 2014. Mogherini was Italy's Minister for Foreign Affairs and International Cooperation from 22 February 2014 until 31 October 2014 in the centre-left Cabinet of Matteo Renzi. She is a member of the Italian Democratic Party and the Party of European Socialists. In July 2014, given the large number of Italian MEPs belonging to the S&D group following the 2014 European election, the European Council considered her as a candidate for the position of High Representative of the Union for Foreign Affairs and Security Policy, in Jean-Claude Juncker's new European Commission. On 13 July 2014, the Financial Times among other European newspapers reported that her nomination proposal had been opposed by the Baltic states and several Central-European countries, including Latvia, Estonia, Lithuania and Poland, where her stance towards Russia concerning the Ukrainian crisis was considered to be too soft. Nonetheless, on 2 August 2014, Italian Prime Minister Matteo Renzi formally nominated her by letter to EC President-elect Jean-Claude Juncker, as Italy's official candidate for EU Commissioner. NEW YORK - Federica Mogherini with John Kerry, US Secretary of State. SOS Kerry pushed for climate recovery as far as he was able under the Obama administration. President Barack Obama was passionate about working to prevent ocean pollution, reversing climate change and food security. John Kerry is an American politician who served as the 68th United States Secretary of State from 2013 to 2017. Kerry was born in Aurora, Colorado and attended boarding school in Massachusetts and New Hampshire. He graduated from Yale University in 1966 with a major in political science. Kerry enlisted in the Naval Reserve in 1966, and between 1968 and 1969, he served an abbreviated four-month tour of duty in South Vietnam as officer-in-charge (OIC) of a Swift Boat. For that service, he was awarded combat medals that include the Silver Star Medal, Bronze Star Medal, and three Purple Heart Medals. In January 2013, Kerry was nominated by President Barack Obama to succeed outgoing Secretary of State Hillary Clinton and then confirmed by the U.S. Senate, assuming the office on February 1, 2013. Kerry retained the position until the end of Obama's tenure on January 20, 2017, when he was succeeded by Rex Tillerson. USA TRUMP ADMINISTRATION - Federica Mogherini with Rex Tillerson US Secretary of State. According to the Indian Express October 21 2017: Two days after US Secretary of State Rex Tillerson outlined the Indo-Pacific as a major theme in a scene-setting speech ahead of his India visit next week, New Delhi on Friday “appreciated” his “positive evaluation” of the relationship and said it “shared his optimism” on the future direction of Indo-US ties. Hours earlier, US State Department spokesperson Heather Nauert said Tillerson will meet senior Indian leaders to discuss further strengthening of strategic partnership and collaboration on “security and prosperity in the Indo-Pacific region”. “The Secretary’s visit to India will advance the ambitious agenda laid out by President Trump and Prime Minister Narendra Modi during the Prime Minister’s visit to the White House in June,” she said. Rex Wayne Tillerson was born on the 23rd of March 1952. He is an American civil engineer and former energy executive who is the 69th and current United States Secretary of State, serving since February 1, 2017, under President Donald Trump. Tillerson joined Exxon in 1975 and rose to serve as the chairman and chief executive officer (CEO) of ExxonMobil from 2006 to 2016. Tillerson began his career as an engineer and holds a bachelor's degree in civil engineering from the University of Texas at Austin. By 1989 he had become general manager of the Exxon USA central production division. In 1995, he became president of Exxon Yemen Inc. and Esso Exploration and Production Khorat Inc. In 2006, Tillerson was elected chairman and chief executive officer of Exxon, the world's sixth largest company by revenue. Tillerson retired from Exxon effective January 1, 2017. With so many years in oil, we wonder if he is capable of helping President Trump lead the United States into a sustainable economy that could be in tune with the United Nations agenda for a circular economy. For sure, any economy that is dependent on oil for energy will be at a disadvantage for a time when the oil runs dry. Leadership is planning ahead to secure peace, energy and food security. We have our fingers crossed that SOS Tillerson might shift the years of ingrained oil-man to favor renewable fuels for the sake of the US economy. On 30 August, Europe's socialist Prime Ministers met prior to the convening of the European Council, at which she received the approval of the Party of European Socialists. On the same day the President Herman Van Rompuy announced that the European Council had decided to appoint the Italian Minister as its new High Representative, effective from 1 November 2014. The group of commissioners involved in external relations — neighborhood and EU enlargement, trade, development, emergency and humanitarian aid, migration, energy and transport — meets monthly, with Mogherini in the chair. At her first press conference she declared her efforts will be devoted to establishing discussions between Russia and Ukraine to solve the crisis between the two countries. In 2015, Mogherini won praise for her role in negotiating the Joint Comprehensive Plan of Action, an international agreement on the nuclear program of Iran, and along with Iranian Foreign Minister Mohammad Javad Zarif was the one to announce the accord to the world. 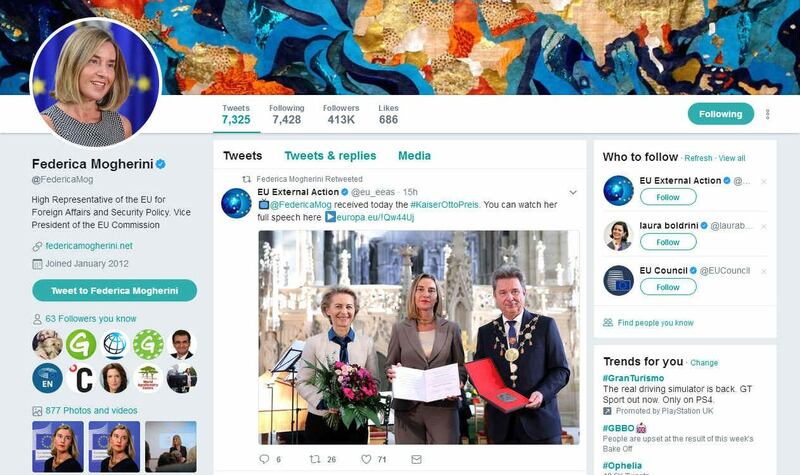 In 2016, she appointed chief negotiator Helga Schmid as Secretary General of the European External Action Service (EEAS), following the resignation of Alain Le Roy. Since 2015, Mogherini has been serving as a member of the European Commission’s High-level Group of Personalities on Defence Research chaired by Elżbieta Bieńkowska. In April of 2017, Mogherini paid her first visit to India in an official capacity as EU representative, discussing issues including climate change and anti-terrorism.